Oliver Queen has heard of the legend and faced his League of Assassins, and in tonight’s Arrow midseason finale, Starling City’s vigilante will finally come face-to-face with the Season 3 main antagonist: Ra’s al Ghul. in “The Climb,” Oliver is delivered an ultimatum by Ra’s’ daughter Nyssa: find Sara Lance’s killer in 48 hours or the League will start killing people in Starling City. In response, Oliver heads to Nanda Parbat to meet with Ra’s, and judging by the preview below, it doesn’t look like things will go smoothly. Evidently the only way to resolve a dispute like this is to sword fight shirtless on top of a snowy mountain. Yup, with swords. Ra’s was mentioned periodically throughout Season 2, and you could tell from the way people talked about him that he is dangerous. Anyone that can scare Malcolm Merlyn into hiding is a force to be reckoned with. Viewers got their first glimpse of Ra’s this season in “The Magician,” but this will be the first full episode featuring Matt Nable playing the League of Assassins leader, and what better way to make a full debut than fighting your main enemy in an epic setting, right? 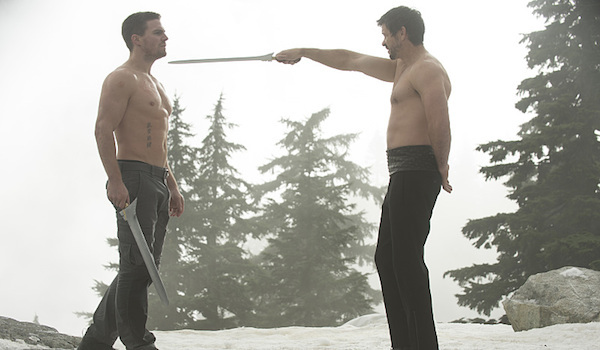 Oliver may be a skilled fighter, but I suspect this fight is going to go the same way as his fight with The Dark Archer in the Season 1 episode “Year’s End”: badly. Even if he isn’t the centuries-old man that he is in the comics, Arrow’s Ra’s al Ghul has trained for decades in combat and is the leader of the most shadowy group of killers in the world. The preview may have shown that Oliver is at least capable of using a sword, but Ra’s is probably better. The show is called Arrow, so Oliver won’t be killed, but it’s likely he’ll be injured worse than he’s ever been, which will certainly have consequences for Team Arrow and Starling City. Hmm, are we being inspired by The Dark Knight Rises, Arrow writers? Tonight’s episode will also feature Ray Palmer attempting to make “amends” with Felicity, and Laurel will be visited by her mother Dinah, played by Doctor Who’s Alex Kingston. Official images for the episode last week also revealed that Maseo Yamashiro, Oliver’s handler in Hong Kong in this season’s flashbacks, is part of the League of Assassins, although whether they reveal how he got here remains to be seen. Every ninth episode of Arrow has always changed the game somehow for that season, and it looks like tonight’s episode will be no exception. Arrow's midseason finale airs on the CW tonight at 8 p.m. EST.